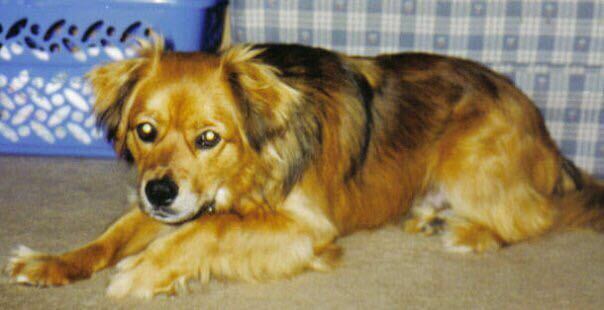 I sometimes miss our family dog, Shadow. Shadow was a lovable mutt, but he was also—there’s simply no other way to put this—stupid. Now, I think my expectations of a dog’s intelligence are fairly realistic. For instance, I never thought Shadow would join a book club, solve quadratic equations, or provide a cogent explanation of the last episode of Lost. I never expected him to convincingly explain to me the public fascination with the Kardashians. But his ranking on the scale of canine stupidity did seem abnormally elevated. One of his most endearing traits, however, was his dimwittedness. If I ever uttered the words, “Shadow, let’s go outside,” he’d dash for the front door, slide on the parquet, and slam into the door face. If I were to fake-throw a tennis ball, he’d run down the hallway to retrieve a ball I still had in my hand. He did things like that for 13 years. We really loved that dog. As dimwitted as Shadow seemed to be, his understanding of shame was incandescent. If he jumped up on a piece of furniture or chewed on something besides a dog bone, all I had to say was, “Shadow,” with a tone suggesting he was in a heap of trouble. He would immediately slink to the floor, roll over on his back, and spread out his legs. To this day, when I hear the shame word, the image of Shadow’s prostrate posture flashes across the screen of my brain. When it came to shame, Shadow’s intelligence was Mensa-level. Some Drama People have Mensa-level intelligence but Shadow-level stupidity when it comes to shame. When I say shame, I’m not talking about that unwarranted sense of worthlessness and self-deprecation carried around by some people like overstuffed backpacks. I’m talking about the inability or unwillingness to feel bad about personal wrongdoings. I’m right; you’re wrong; end of discussion. I only see where I’m right. If I’m wrong, so what? My concern isn’t about me hurting you but about you hurting me. I’ll not change because I’m not wrong. Shame serves the same function as that sick feeling in your stomach after you impulsively eat four bales of cotton candy. It’s a feeling that leads to self-correction as in, “Ugh, I really shouldn’t have eaten that. I’ll never do that again.” It’s a bad feeling that has a good effect—as long as that bad feeling is heeded, that is. Drama People disregard those bad feelings. That’s why they’re impervious to shame. Without a reality-based sense of personal wrongness, Drama People don’t change because they anesthetize the uncomfortable feelings that might lead to self-correction. British soldiers were being held captive in a prisoner-of-war camp deep inside Japanese-occupied territory. The prisoners were forced to construct a bridge that would help complete a rail line connecting Bangkok to Rangoon—a vital link in the Japanese war effort. Their commanding officer, Colonel Nicholson, argued that the men under his command should be treated, not as slave labor, but as dignified construction workers. Building a first-class bridge, he reasoned, would make an irrefutable case for the superiority of British soldiers. An American prisoner, who had previously escaped from the camp, returned with a commando team to blow up the very bridge being constructed under Colonel Nicholson’s command. The movie ended in a mess. The commandos were discovered, a melee ensued, and in the chaos of the moment, Colonel Nicholson had a sudden realization. Waking up to the reality that completing the bridge would simply help the Japanese kill more British soldiers, he uttered the question, “What have I done?” With that, he fell on the plunger detonator and blew up the bridge. Implied in the question, “What have I done?” was shame. Colonel Nicholson realized the error his ways, felt bad about the realization, and took action to correct it. That’s what’s supposed to happen when normal people feel shame. When Drama People feel shame, on the other hand, they move quickly to disregard the discomfort. They rationalize their actions, justify their behaviors, or blame someone else. They cling tenaciously to the notion: “There’s nothing wrong with me; it must be you.” That’s why they’re impervious to shame. It just occurred to me that I’ve mixed together far too many metaphors in this letter—Shadow, cotton candy, and Colonel Nicholson. You left out perhaps your most sublime metaphor: plunger. That is worth a thought or two. I’m so glad you didn’t use the term detonation device. This one was again very close to home for me. I’ve had conversations recently that left me wondering how someone could respond with statements like you listed in their stance (I’m right, you’re wrong; I’ll not change; etc.). The ‘lack of internal equipment’ is a great way to phrase their stance on being confronted with wrongs they have inflicted on others. It would be much easier to re-start a relationship with them if they could only bring themselves to see that I’m hurting and it is caused by their actions and words (or at least admit to me their role). The things you describe are common when dealing with Drama People. It’s frustrating indeed! Thanks for what you shared. Your blog and others comments are so, so, very true. The blog was great to read because it supports people who come in contact with these people. Sometimes I have wondered who taught them to never ever say the words I’m sorry. Their steadfastness is truly amazing. It’s like a foreign language to them ! And more then foreign, it is as if something dire will happen to them if they say those words. At times I have found this revolting. Unfortunately for us, it just is what it is, or they are what they are.